"This wasn't their war but it was their story... and they wouldn't let it go!" Under Fire is a political and historical movie set in the last days of the Nicaraguan revolution. 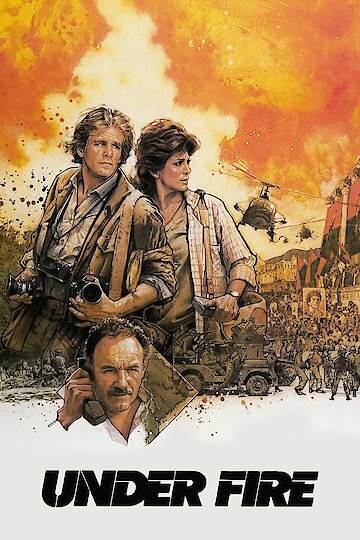 The movie was created in 1983, but the setting of the movie is right before the collapse of the Somoza regime in 1979 Nicaragua. It shows the story of a photographer who begins as a neutral photographer and quickly becomes deeply involved as a human rights activist. His journey starts in Chad and then spirals to Nicaragua when the dictator, Somoza, has fled to Florida. Russell Price the photographer meets many new and exciting people who help him better his skills as a photographer and make a different including a radio journalist and a Time Magazine reporter. The movie showcases the war-torn country and the struggling guerrilla forces who have been staggering to fight almost for a decade before. Through the political unrest and human cruelty that Russell is witnessing, the movie balances how to be an active person involved in our world and not one who is a passive observer. Under Fire is currently available to watch and stream, buy on demand at Vudu, iTunes online.